Sarens unveiled one of the mightiest cranes worldwide ! 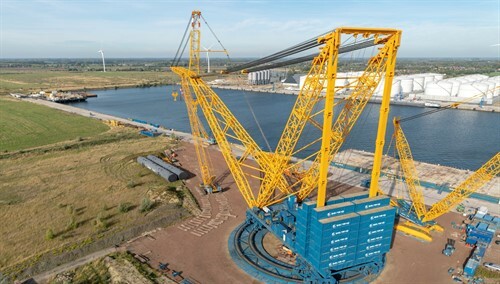 At the port of Ghent, in Belgium, Sarens has recently presented its new crane SGC-250 with impressive capacities. Being one of the biggest and mightiest cranes in its range, it has a maximum load moment of 250 000 metric tonnes, allowing to lift until 5000t. Even with a radius of 100m, the SGC-250 can lift until 2000t. Its main boom length can be extended from 118 to 160m, and its jib can reach 100m. In total, this combination provides an incredible height of 250m, with a 275m radius ! The crane will be used in 2019 during four years to build the nuclear plant of Hinkey Point C in England.